Here in this Chapter, we will go over ALL the physical and circumstantial evidence (real or imaginary) against Victor Licata. To avoid complications (conspiracy theories etc), the psychological accusations (homicidal tendencies etc. ), against him will be examined in a following chapter. In Chapter 6, we looked briefly at all the evidence (real or imaginary) used to create the illusion that Victor Licata was guilty. Here in this chapter, we will go over (piece by piece), all of the physical evidence compiled against Victor Licata. Hopefully (in so doing), prove to the reader just how nonsensical, if not out and out factious, the (so-called) evidence really was. Simply put, there never was any evidence that Victor committed the crime. But first, let the reader be FOREWARNED – there is something known as the Margaret Mead effect. Margaret Mead was an anthropologist who became widely noted after publishing her findings on sexuality in the Samoan Islands. However, she was also greatly criticized by other anthropologist's who claimed her findings were wrong and even wishful thinking. They in effect accused her of establishing a theory and then going out and looking for selective facts that would validate that theory. Whether that is true or not is irrelevant, what is relevant (and what the reader should take note of), is the fact that the author has already pre-established a theory. That Victor Licata is innocent and did NOT commit the crimes that he was accused of. And it can also be said that he is now trying to fit the facts around this viewpoint instead of trying to look at the facts objectively. Maybe so, but the mere fact that the author brings up this matter should indicate that some precautions have been taken to counteract this effect on his part. In addition, one must ask, where was the objectivity on the part of Harry Anslinger and that of the Bureau of Narcotics during the Reefer Madness era? Surely at one point they must have known the truth, --- yet where was their objectivity? Where was their apology, their, "Oops" I made a mistake, ---sorry about that, etc. Thus I feel it's my place to look over the facts, not through the past lens of the Drug Police, but objectively looking at them the way a lawyer defending his client would do. --- What would a jury of twelve members of our peers say? Would they say that the evidence was fabricated, false and misleading etc. . . . or that it indicated that Victor was guilty? Oct 18, 1933 p1 - "Crazed Youth Kills Five of Family with Ax in Tampa Home"
Additionally, the article in “Inside Detective (July 1938), which was written with the help of one of the investigating detectives MAKES NO MENTION of any blood on Victor’s underwear. IN addition no mention of bloody underwear is made mentioned of anywhere in the police reports, court records, nothing. Surely such a factor would not have gone unnoticed? We believe that the “Inside Detective” version of the story should be believed. Again, the Tampa Times Newspaper article was written in great haste to sell newspapers. While the Detective Magazine story was written with the help of – on the scene police detectives. Granted the whole magazine version of the story has at this point been discredited, still logic and reason would dictate that if a lie was being told, that it would have gone the other way. Also, (as can be seen) from the picture below, any kind of red stain, would have shown through Victor’s white shirt. Thus we believe that Victor’s underwear (assuming he is even wearing any) were not soiled with blood. Guilty: --There is no proof that Victor’s underwear was not “stained with blood.” And if he is shown wearing a white shirt and clean pants, this means nothing. He simply must have cleaned himself up before the police came. Which made it the hottest Oct 16 on record. Next, given the humidity found in Florida, and the amount of blood spilled on the beds, it could easily have taken over 10 hours for the blood to dry. Thus making it quite possible for Victor to have walked around in his underwear and got blood on them. But again, there simply is no evidence that his underwear physically had any blood on it. --- Thus, not guilty. NO blood could be seen on Victor's hands or under his fingernails. The photos of him taken that day clearly show someone wearing a white shirt with clean hands and obviously NO BLOOD of any kind. Guilty: -- No copy of the Lab report has been found – But if it was, It will show that he had blood on his hands. Not Guilty: -- No copy of the Lab report exists, in all probability because it never existed. This was just one more of W.D. Bush’s (ah) little white lies. Had such a finding been made it surely would have been entered into the police report -- (It was not). However, this bit of evidence (one way or the other) is irrelevant – All it will show is that Victor, got out of bed late in the afternoon, and tried to wake-up his father or other family member. But again, there simply is no evidence that his fingernails ever had blood underneath them. Oct. 18, 1933 - Editorial Section - "Stamp Out This Weed Of Flaming Murder"
“Marijuana! -- Smoke that inflames the brain. Vapor that turns the blood to seething, boiling lava. However, the problem here might be solely one of word usage within the American English language. For example, the metaphor; "His fingerprints are all over the weapon", might actually mean that his fingerpints were physically on the weapon OR it could simply mean that there was solid evidence that that weapon was his. It's just a funny quirk of American English. thus the above expressions (both found in the Tampa Times newspaper) could be making use of the language just to say Victor did it for sure, as opposed to implying that his fingerprints were in fact ALL OVER THE MURDER weapon. We believe that the “Inside Detective” version of the story should be believed. To begin with, the Tampa Times newspaper article was written the day after the murders (without much research time) while the Detective magazine article (written years after the fact), was written in cooperation with one of the detectives assigned to the case. Thus there were no fingerprints found on the axe. And yes, granted, the article seems to be a bit of fiction, logic and reason would indicate that if a lie was being told it would have gone the other way. Guilty: -- Whether or not his fingerprints were on the axe is irrelevant – Victor simply wiped them clean with a towel. Thus lack of fingerprints meant nothing. 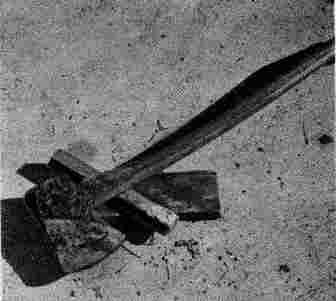 Not Guilty: -- This bit of evidence is irrelevant – The axe was a house tool. Naturally Victor’s fingerprints would be on it. Thus even if his fingerprints were found, all it would prove is that an autistic kid (in a state of shock) simply picked it up and moved it. However, the evidence (as per eye witness accounts), indicate that the axe did NOT have his prints on it. Additionally, other then the above sighted newspaper, NO OTHER references (Police Report, Court documents etc. ), can be found regarding the matter. Which would imply that that Marihuana was in the house – however, the quoted Detective [W.D. Bush] presents only his opinion, he has no actual proof that Marihuana was mixed in with the tobacco. And the (speculated evidence) presented is (looking at it objectively) nonsensical at best. Here he claims that someone (we presume he meant Victor) smoked a couple of Marihuana cigarettes AFTER THE MURDERS. YET WAIT, wasn’t Marihuana supposed to be the creator of violence, so shouldn’t that have been before the murders? In addition (again objectively speaking), it would seem to me that if Marihuana was being used in the house, then there must be a source of it – somewhere within the house. Yet nothing. Last of all, there is the fact that no known copies of any lab report exists --- which leads us to the conclusion that no such animal ever existed. Were Marihuana actually found in the house, it most assuredly would have been looked at under a microscope by some lab technician etc. While no known copies of any lab report exist (assuming one was even done), be that as it may, Bush’s story just doesn’t make sense and there is no solid evidence of any Marihuana in the house. Guilty: -- A Detectives word is good enough -- there was Marihuana in the house. Not Guilty: -- No real evidence was found to make such a conclusion. In addition, the statements of the quoted detective (W.D. Bush) have been called into question. “Axman Kills 4 Tampans - Crazy Youth Slays Family"
There is simply NO EVIDENCE to support the theory that Victor Licata ever made use of Marihuana. A close observation of ALL the first hand newspaper accounts, attribute possible Marihuana use to only two individuals – Chief of Detective W.D. 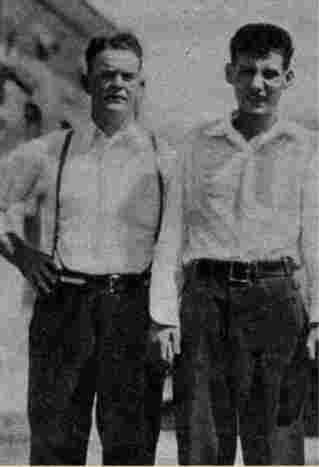 Bush and Florida Narcotic Inspector Frank S. Caston. Even Earle Rowell (although not giving names) implies that he also got his information from these two individuals. AND under normal circumstances, given their badge of authority (chief of Detectives, Narcotic Inspector), these statements would be solid – End of Story. HOWEVER, as we have already seen (Chapter 10) W.D. Bush, was a spinner of tall tails and NOT ALL OF THEM TRUE. Which is a polite way of saying something else, and here lies the problem. Once someone (badge of authority or not), is caught lying just once about a matter, then everything else that he says on that subject is automatically subject to challenge. ---- In other words; it is no longer our place to have to prove that he is not telling the truth, but rather the other way around. As (we feel) we have already introduced enough evidence to prove that he did not (ah, how shall we say it”), wasn’t telling it the way it was. Thus any statements made by him (unless they can be established by facts), can be safely disregarded. As for Frank S. Caston statements – No-where does he say that Victor was a Marihuana addict, no-where. And while we were not there at the time, it seems obvious to us that when queried by the reporters, he simply stated that they had been conducting a Reefer investigation at the time, and probably relied on W.D. Bush for this information about Victor. And while it is possible that Victor Licata (despite his denials) might have made use of Medical Cannabis. Example: Victor was under the care of a psychiatrist at the time and as Cannabis was being successfully used as a treatment for mental illness at the time. At the present time, there simply is NO EVIDENCE to support the theory that he did. Guilty: --Two cops said that he was a Marihuana addict, end of story. Not Guilty: -- There is no physical evidence to indicate that Victor ever used Marihuana – for any reason. And the statements of one of the two cops in question have been proven to have been fabricated. And the other (by his silence) also implicates himself in the conspiracy. Now recalling here that nationwide Alcohol Prohibition has just ended, but was still the law in Florida, at the time. We can conclude that activities were taking place that were definitely ‘Against the Law’. And (by hook or by crook), Victor’s father would have had to have known about his sons activities. Thus, assuming that one can classify alcohol as a drug, the house Licata was indeed operating an illegal business. However there is still no evidence that the Licata’s were either using or pushing anything stronger than moonshine. The problem here is that Victor (according to police) would have been about 21 years of age at the time. Actually 19 or 20 by our accounts, however in any case a bit old to have been a high school student, etc. While it is true that illegal activities were taking place, this could be said about a lot of situations. Example; It is (technically) against Federal Law to make use of Doctor prescribed Medicinal Cannabis YET a lot of people (finding no alternatives) continue to make use of it anyway. That a dog had identified Victor Licata as the killer. MUSEUM NOTE: As there were no witnesses to the above remarks, it is obviously (and understandably) a fictionalized account. However, let us examine what is being said; ”As the murderous invader entered the dog leaped for his throat.” Assuming it was Victor, why would the family dog attack him? Do family Dogs go around attacking their human owners? And assuming (just for the sake of argument), that the Dog really hated Victor; ---weren’t the Licata parents devoted toward their son? Thus logic and reason would dictate that if the Dog simply didn’t like Victor and was out to get him, that Victor's parents would have gotten rid of him long ago. In addition, such an action would have caused Victors shoes, socks, pants etc., to have become bloodied etc. . . .
“. . . . The dog, one shoulder terribly mutilated half dead from the blood-loss, followed the murderer’s trail to the sidewalk. Crawling and pulling itself along, the courageous brute followed for a dozen yards and there collapsed. A few minutes later the dog revived sufficiently to retrace its course and crawl beneath the front porch to lick the aching wound. MUSEUM NOTE: This part of the story (while fictionalized) is also suspect, as it would imply that a trail of blood from the front bedroom -- through the hallway --- through a now open front door --- through the front lawn -- down to the sidewalk (the blood coming either from the bloodied shoes or from the dog) existed. No evidence to such a blood trail exists. In addition, one must ask -- How did the front door get closed? If one assumes W.D. Bush's account (see chapter 10), it must then be presumed that the dog closed and locked the front door on his way out. MUSEUM NOTE: Obviously, this part of the story (now no longer fictionalized) is false. All other accounts, including the police report state firmly that, the officers entered through a back window and that both front and back doors had been locked. It is our belief that W.D. Bush was just trying to cover his tracks on this detail. “. . . . The dog,” he said. “It’s the dog, bleeding and in terrible shape.” We coaxed the animal out. It dragged itself painfully and slowly towards the policeman’s outstretched hand. It was a half-grown German shepherd. In its right shoulder was a raw rent that laid open skin and flesh until the shattered bone was visible. “ . . . we took him to the veterinarian’s hospital, and there a strange scene was enacted. Victor Licata stood in the center of the veterinarian’s office. An attendant was sent for the wounded dog. The young man watched the door through which the dog would enter, and I saw his eyes narrow. The muscles in his sallow jaws worked convulsively. He seemed to brace himself for what he knew was coming. Under the ministrations of the veterinary the dog was able to limp along on three legs, the fourth being supported by splints and bandages on the injured shoulder. The animal paused in the doorway. . . Then slowly it crouched, its eyes fixed on the face of the marihuana fiend. Before the attendant could tighten his grip on the leash, the dog had sprung. In spite of its injury, forcing itself into the air with a lunge of his powerful flanks, the German shepherd leaped straight for Victor-Licata. MUSEUM NOTE: We’ve talked to several (for lack of a better name) Dog-allogests, dog lovers etc., and while views vary, it is their opinion fear is the last thing anyone wants to show a dog in that condition. But that’s exactly what Victor did --- and that that was the reason why the dog started to act up. Remembering that Victor was indeed said to be mentally autistic and that he was in a state of shock at the time, his fear response should not seem that unusual to us today. You probably could have taken an individual in such a condition and shown him a rat and have obtained the same fear response. “We dragged the dog away, growling and fighting, its mouth frothing and its head turned always towards the trembling youth. Needless to say, there are numerous problems with the above stated story (which we feel is a work of total fantasy) on the part of W.D. Bush. However, it must be noted that he was indeed the Chief Tampa Police Detective assigned to investigate the Licata murders. Thus we must ask; Why tell such a big (ah) untruthful story? The answer is already obvious to many of the readers, however the conspiracy side of the book can wait for a future chapter. Here it is enough to say that William D. Bush was obviously trying to cover up something. First, there is no mention of a Dog made in any of the newspaper stories, nor is it mentioned in the Police Report, nor anywhere else (other than in the Inside Detective magazine story) for that matter. Oral reports that we have been able to obtain from (living friends, relatives) of the Licata Family have stated flatly that the Licata’s simply DID NOT HAVE A DOG. Next, if the above story were anywhere near true, there would have been blood all over the front porch, lawn, sidewalk, and hallway of the house. There was not, or at least no one connected with the newspapers noticed it. According to the story, "There are dog hairs in those stains on the carpet and dog hairs in the stains through the hall to the front door" Which is nonsensical -- granted dogs do shed hair, but NOT in those amounts described. Victor Licata only weighed 113 pounds at the time -- The idea that he would be able to kick a dog that size five feet across the floor is nonsensical. How did the front door get closed and locked? The whole story rests on the dog somehow managing to somehow walk out of the house (which assumes an open door, yet somehow both doors were closed and locked. One presumes that the dog himself closed the door on the way out. Then there are other numerous details that bring great doubt to the whole dog story, such as the fact that no veterinary bill shows up on the Licata estate records, etc. Thus one must call into question whether a dog even existed. But once more this begs the question; Why go though all the trouble to make up such a story in the first place? 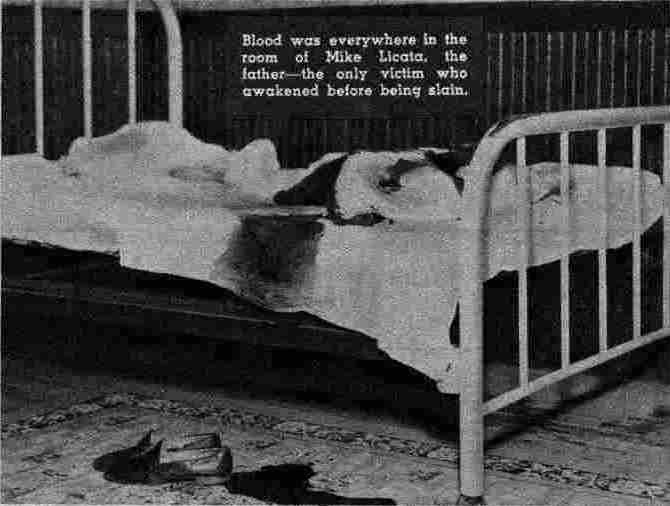 The answer may lie in this old crime scene photograph of the main bedroom, the one in which Mike Licata's body was found in. On a bed in the front room they found the bodies of Michael Licata, a welter of blood. He had apparently died with the first blow of the killer's axe. Now once more, look at the crime scene photo --- DO YOU SEE A PROBLEM --- Note where the blood stains are! Obviously they are NOT where they are supposed to be. If Mike Licata was found pinned between the bed and the wall, wouldn’t the blood be elsewhere? This point would not have been lost of the actual writer of the story (Jack DeWitt) and so [AGAIN IN OUR OPINION] Detective Bush concocted the whole Dog part of the story as part of a cover up. THUS it is the museums opinion that there was NO DOG; --As for the Dog picture (well, no we don’t know where it came from), but it can be assumed that Mr. Bush just got it from some archive or another. For all we know it might just be a picture of a police dog in training etc. Guilty: -- A Detectives word (the Chief Detective on this case) is good enough. Plus there is the actual picture of the Dog so he had to exist. Not Guilty: -- True, W.D. Bush as Chief Detective does have the badge of authority, which would normally imply that we must give him the benefit of the doubt. However, once such an individual is caught lying (even once) on the subject, then everything changes. Badge of authority or not, --now it is up to him/them to prove that it happened. And while there is a picture of a Dog, anyone can get a picture of a dog, it means nothing. 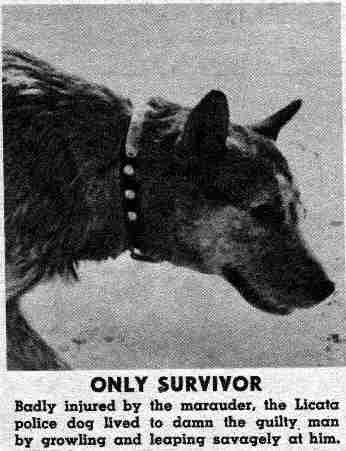 Why was the dog not reported on by the newspapers, in the police report, etc., but most damning of all is the fact that living peoples (familiar with the family) state that there was NO DOG. Thus it is our feeling that the whole story was fabricated in order to explain away the photograph taken at the crime seen. Because everyone agrees that Victor Licata was found (at the scene of the crime) inside his house when the police arrived, we will dispense with providing proof there of. However, --- (dua-ah! ), he lived there! And as we will see (chapter 17, contains some scenarios of what might have actually happened that night), this of-and-by-itself means nothing, but what does mean something is the fact that he was found inside a locked house. Or was he? “The door was open, the front door.” The words came in a dreary monotone from the pale lips of the young man. “I might have known something . . . . ,” His eyes, filled with understanding for one fleeting moment, suddenly clouded. It was as if a light had been switched off behind him. His stare thereafter was vacant. If this was the case, he simply would have locked the door on his way to his (the fourth) bedroom, etc. In all possible scenarios, Victor would have had a key to get inside. And in almost all scenarios (as to what really happened that night) call on him to have simply gotten home (drunk) and gone straight to his bedroom, and simply slept it off. That Victor was determined to obtain a handgun for whatever reasons. That just a few days before the murders, Victor’s father had to take a handgun away from him and hide it. Example: The day before, Mrs. Licata reported their pistol missing. Husband searched for it and finally discovered it and relieved Victor of its possession. That the day before the murders, Victor attempted unsuccessfully to borrow a pistol from a shop owner that he knew. Note here that the way the newspapers are phrasing their words, ---it would appear as if Victor wanted a handgun for evil intentions, AND additionally that his very own family was living in fear of him. Here we are actually dealing with three totally different issues (a) was the Licata Family living in Fear of Victor and (b) was Victor trying to obtain a handgun and even a third issue (c) WHY was Victor trying to obtain a handgun. Let’s begin with what appears obvious; that Victor wanted a handgun. This appears to be true, although it is possible that (a) the newspapers got it wrong, or (b) that the family relatives (the source of the information) simply got it wrong. But be that as it may, it is the opinion of this museum that Victor Licata did indeed want to get his hands on a handgun. Next, it is also our belief the Licata family was indeed living in fear at the time. Proof of that can be found in the fact that Mike Licata (Victor’s father) was said to be sleeping with a handgun under his mattress. BUT, here the issue is ---- Were they living in fear of Victor or in fear of something else? And for that matter, -- Was this something else the reason why Victor wanted the handgun in the first place? OR for that matter, What was this SOMETHING ELSE that the Licata family was in fear of? Granted Victor was mentally autistic; granted these words might have been illusions of his mind, BUT it is of interest to note that no one was taking him seriously at the time. It seems that everyone simply wanted to establish that it was either the Marihuana or his mental illness that was the cause of the murders. ---- In effect there was never an investigation into who or what this “something else” that was going to come and get him” actually was? Now granted, the author of this book is beginning to speculate a bit, however, let’s just look at one more aspect of this case. Here once more the question must be asked; Why was Victor’s father said to be keeping a handgun underneath his bed mattress? According to the news reports, Victor’s parents were “Very protective of him.” So are we expected to believe that the handgun was supposed to be meant as a form of protection against Victor (who only weighed 113 lbs. at the time)? What was supposed to happen, was Mike Licata supposed to use the gun to kill his own son with it? Logic and reason would dictate that the gun was being kept as a form of defense against the “Something Else” that Victor had been talking about in his jail cell. --- See Chapter 17 which deals with various scenarios of what really happened that night. Additionally, it should be pointed out that Victor was a moonshine runner, it is also quite possible that he wanted the gun to protect his cargo from attack by other (ah) involved in the trade. As an aside; for those of you who believe in gun control. One wonders what would have happened had Victor HAD A HANDGUN at the time of the murders. Would he have come home so drunk? Would he (who had been crashed out in the fourth bedroom) have awakened, taken out his gun and have saved the family? Before leaving this chapter, there is yet one more subject that is worth mentioning. And that is the evidence that simply didn’t make it’s way into the discussion. The evidence was deliberately left out. PHYSICAL HEALTH – The Lunacy report described Victor Licata’s health at the time simply as being “POOR”. Which might have been an understatement. And granted he was 5’ 8” tall, however (according to the State Hospital records) only weighed 113 lbs. From a physical standpoint, one wonder’s if he could have even held an axe let alone have used it. “ When officers arrived at the home they found the youth staggering about in a human, slaughterhouse. With an ax he had killed his father, his mother, two brothers, and a sister. He seemed to be in a daze. . . . The officers knew him ordinarily as a sane, rather quiet young man; now he was pitifully crazed. 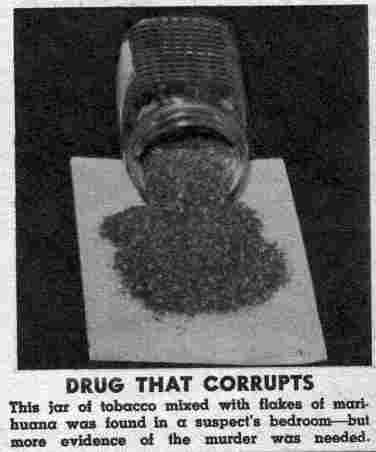 “ ---- The American Magazine (July 1937). QUESTION: Given the shear number of high level people, who knew the truth. Why didn’t even one of them speak up and tell the truth? Why did they remain as quiet as the lambs over on this matter? --- Proof of and by itself that (at least) a conspiracy of silence did occur. AND here it should be noted that the author (without proof) believes that at least one of them did come forth. AND that it cost him his life in the doing (see chapter 150. THE SERIAL AXE MURDERER – Most damning of all, why didn’t anyone anywhere mention the fact that there was a serial axe murderer operating in the Tampa area at the time? Do they not feel that that was a relevant factor. Here in this chapter, we have gone over all the physical evidence that we have been able to find against Victor Licata. Hopefully we have cast some doubt into the readers mind about the quality of the evidence against him. In the next chapter we will cover all the psychological evidence/factors that like the physical evidence was used to frame this innocent young man. [13B]-- Various dogalogists have looked at the picture and have stated that this is NOT a full blooded German Shepherd, but that whatever it was, it would have been around the same size and weight. 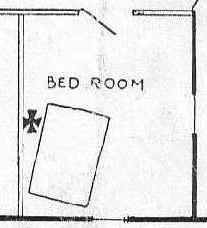 [13C]-- Given the fact that we are dealing with a 1930's boxless spring bed (note in the crime scene photo that the mattress appears to levitating up in the air by itself). This expression "Pistol between his mattress" is most assuredly a metaphor. But does it matter, the idea is simple, the licata family was living in fear.